One of the best ways we can limit our exposure to ever-increasing energy prices, as well as doing our bit for the planet, is to ensure our houses are as energy efficient as they can be. SHS is a not-for-profit company specializing in energy efficiency and the Green Deal, and have offered members of Ealing Transition free energy audits and, depending on the level of interest, the possibility of a workshop on draught-proofing your house. The ‘Green Deal’ is a government initiative which allows householders to make energy-saving improvements to homes or businesses without having to pay all the costs up front: money is paid off in instalments through your electricity bill. 1. A free 10- minute “door-step” evaluation of your property and circumstances to determine what energy-saving options may be possible and what grants may be available to you. A trained volunteer will visit you at a convenient time, and talk you through a questionnaire that is presented on a small tablet computer. The questions are very simple, e.g. does your house have solid walls or cavity walls? 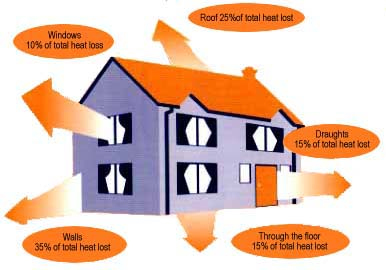 Do you have central heating or individual heaters in each room? Do you have double or single glazing? Is you loft space insulated? The volunteer interviewer does not have to enter your house and the whole process takes between 10 and 15 minutes. The results are reviewed by the specialist energy-saving company SHS, which will subsequently write to you with energy saving suggestions and if appropriate offer you a full technical survey to determine the best solution and potential sources of grants or other funding possibilities. SHS has recently evaluated hundreds of such surveys from Southall on behalf of Ealing Council. 2. A free full technical survey of your property to determine which energy saving options would be most cost-effective, and which support funding options are available. While working in the Ealing area over the next couple of months, SHS have offered free technical energy-saving surveys of Ealing Transition members houses. In this case a qualified surveyor will spend a couple of hours in your house making measurements and calculations about a range of potential solutions. They will discuss with you what would be most practical and cost-effective and follow up with a proposed programme of work and potential funding arrangements. You can then choose whether or not to continue with this plan or to do something different. 3. Train as a volunteer interviewer to conduct the “door-step” surveys for your local friends, family, neighbours etc. If you would like to help others become aware of the energy saving help that is available, SHS can provide you with a couple of hours of basic training for conducting the surveys. You are provided with a Samsung Galaxy touch pad on which the survey is pre-loaded in the form of questions in text and graphics forms. You don’t have to type in anything except the name and address, since the range of potential answers to the questions are already defined and shown in words and/or pictures on the touch pad. You just touch the appropriate answer on the screen. After completing all of your surveys, the touch pads are collected by SHS for data analysis. SHS will then write to those surveyed offering a full technical survey if the property is eligible for energy saving grants or loans. You can choose whether or not to take up their offer. 4. A practical workshop on draught-proofing your house (and/or those of your friends, family, etc.) SHS, in collaboration with Transition Belsize and Camden Council, has developed short draught-proofing workshops for people who would like a little guidance in reducing energy use. A 15% reduction in energy use is possible just from simple steps like stopping draughts through floor boards, around doors and windows. The workshop also covers heat reflectors behind radiators and simple secondary glazing. We will run a workshop if there is sufficient interest locally. If you would like to know more about or participate in any of these activities, please fill in the form below to contact Graham (we will not share your details with any other organisation, or use them for any other purpose). We would also like to hear from anyone in the area who has any expertise in energy efficiency / retrofitting and who would like to help us.